Mrs. Kader participates in the Conference " Europe plus Defense "
The International Affairs Institute invited Mrs. Kader to attend the Conference entitled "Europe plus Defense", whose keynote speakers were the EU High Representative for Foreign Affairs and Security Policy, Federica Mogherini and the Minister of Defense Roberta Pinotti. Representatives of the Italian government and administration, MPs. military senior officials representatives of the diplomatic corp in Rome, as well as businessmen, academics and representatives of media took part in this meeting. 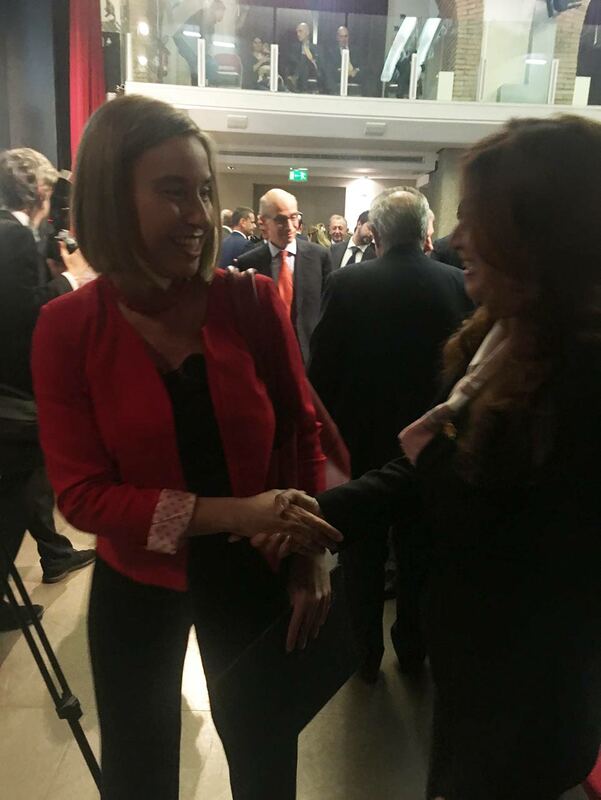 Mogherini and Pinotti, very proud of Italy's role in defense and internal and international security, both hope for Italy to become a driving force also at European level. The aim to be achieved is to build a common European defense that does not compete with NATO, or focused on creating an European army but to become an essential reference point for stability and peace for the international community and that realize an integrated and efficient management of resources in order to rationalize military spending also within individual national states.